When most people complete their work day and head home, Emmanuel “Manny” Sanchez is usually just getting started. During business hours, Sanchez serves as Goodwin College’s Employer Relations Coordinator, working with students and companies to provide mutually beneficial internships. 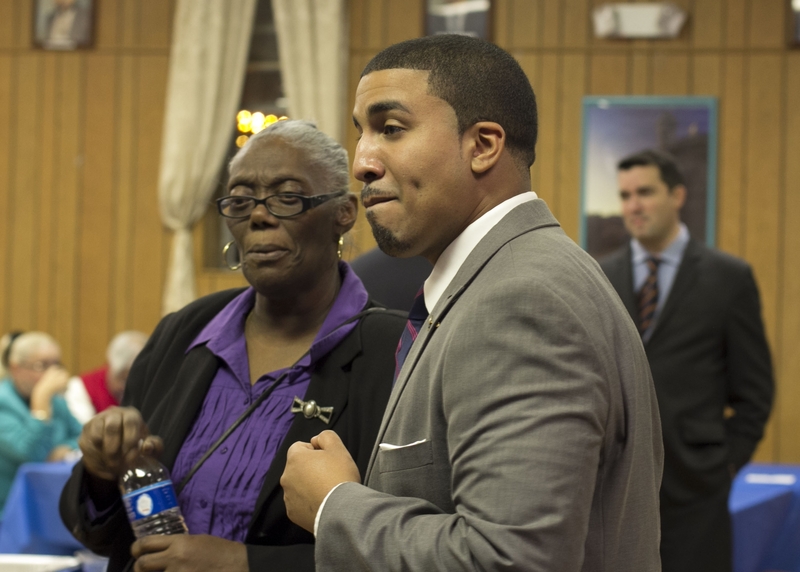 Upon returning home to New Britain, Sanchez assumes his role as the youngest minority alderman to ever serve on the City Council. As if that weren’t enough, he dons another important hat as a head coach of the Connecticut Roughriders, a traveling basketball team. Manny Sanchez balances his work at Goodwin with service to the City of New Britain and coaching the Connecticut Roughriders. While that balancing act may be difficult, Sanchez’s work ethic, service, and commitment to helping others have made him a successful member of all of the communities with which he is involved. His accomplishments in the professional, civil, and athletic worlds have landed him on two prestigious lists. 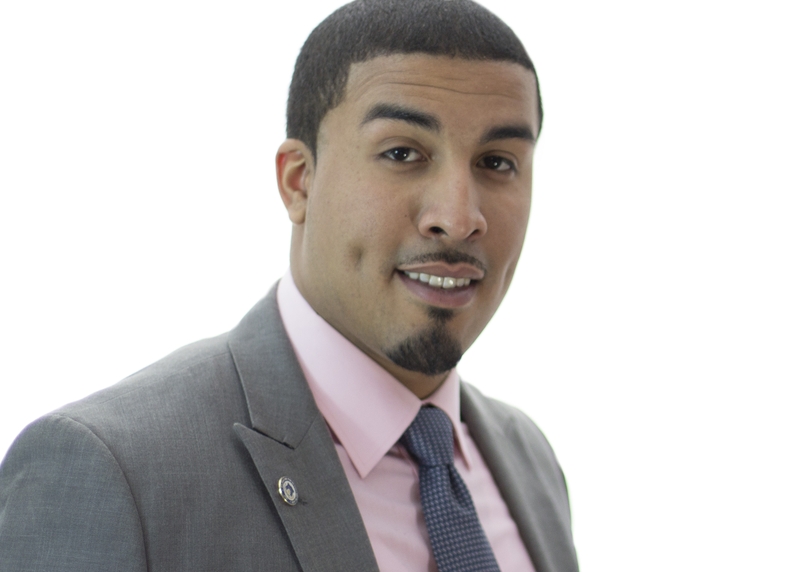 Sanchez has been selected as one of Connecticut Magazine’s “40 Under 40” of 2014, and CT Latino News has named him one of the eight top Latino leaders in the state. Now 25, Sanchez was 13 when he was first introduced to the competitive nature of New Britain city politics. He would canvas the neighborhood in support of local Democrats, working consistently with his uncle Robert to build community support. Years later, Manny Sanchez would be seated on the City Council as a representative to New Britain’s 3rd Ward. Robert Sanchez has gone on to become State Representative to the 25th District, serving the Hardware City in the Capitol. Raised by a single mother, Manny understands the barriers faced by many people in his ward. While New Britain in general has been hard hit by recession, the 3rd Ward, with a high population of non-English speakers and widespread poverty, has an unemployment rate of over 30 percent, according to Sanchez. “There is a strong Latino base in my community that has hit a wall because of communication barriers,” says Sanchez. Determined to help, Sanchez was appointed to the City Council when he was 22 years old. A year later, he ran his first successful election campaign, retaining his seat by running a platform based on job creation and training, education, and economic vibrancy. He is a strong believer that education and hard work are the paths to success. He strives to help members of the community as a whole, and he does not shy away from political positions unpopular with his colleagues on either side of the political aisle. “I’m not afraid of losing my seat, so long as I can look at myself in the mirror at the end of the day and know that I’ve done the right thing,” Sanchez says. Sanchez with Goodwin employee Beverly Carter during a fundraising event. He sees a need for New Britain to reestablish an identity, as it had in the past as the “Hardware City.” He looks to examples like West Hartford developing Blue Black Square as a means of realizing future development while also holding true to roots. Additionally, Sanchez is active in recognizing the contributions of Hispanic Americans, as evidenced by his spearheading the effort for a national monument in New Britain dedicated to the 65th infantry of the US Army. The 65th, known as the Borinqueneers, was a segregated unit that nonetheless served with distinction during both World Wars and the Korean War. Since beginning his career at Goodwin College in 2011, Sanchez has found his employer to be the ideal place to help many people in his community earn an education and learn the skills they need in the job market. “I see the importance behind places like Goodwin, specifically in what they do for people who might not think college is for them,” he says. He takes pride in his service to the College, which brings him into contact with businesses and organizations interested in creating opportunities for Goodwin students. A big part of that responsibility is helping employers understand what sets Goodwin apart. Work and politics aren’t the full extent of Sanchez’s life. A scholar athlete during his high school days, Sanchez remains active in basketball as coach of the Roughriders, a traveling team comprised of talented players from across the state. Sanchez has traveled the East Coast as coach of the Connecticut Roughriders. The team competes against some of the nation’s best college basketball prospects. The schedule is packed for Sanchez, who acts as a mentor in addition to being a head coach. All players are required to maintain high levels of academic success and conduct themselves appropriately. While high schools require student athletes to maintain a minimum 2.0 GPA or “C” average, Sanchez requires students to keep a 2.5 GPA or better. He meets with his players one-on-one to discuss their academics, and at times has made tough decisions to bench some of his star players as the result of falling grades. The students gain valuable experience, traveling throughout the region and the entire country. “For some of these kids, the first time they travel with us on an airplane is the first time they leave the state,” Sanchez says. His ideals, both on the court and in the classroom, have yielded great results. 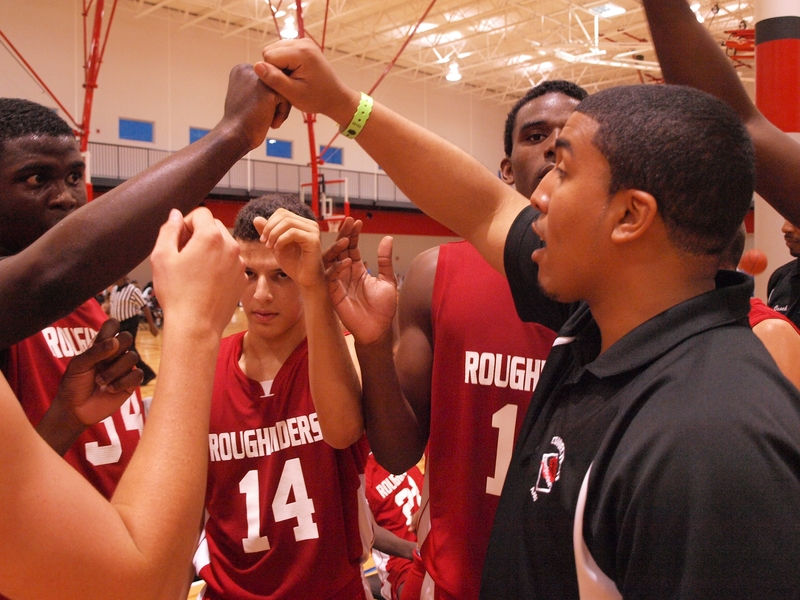 Not only do the Roughriders field an excellent team, but many of the players are being recruited to play college basketball. He practices what he preaches to his players. Between his time as a councilman, Goodwin employee, and coach, Sanchez is himself a student at UConn at the West Hartford campus. Matthew Banville, Goodwin College Assistant Registrar since January 2014, knows much about the benefits and challenges of Army life and is using that understanding to guide the students he works with at Goodwin. A resident of Ellington, Connecticut, Banville had a history with Goodwin College before deploying with the military. 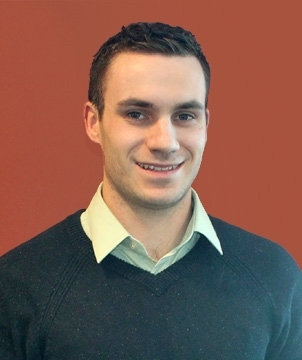 After graduating from Central Connecticut State University in 2010 with a degree in business and completing the ROTC program at UConn, Banville joined Goodwin as an academic advisor. Since joining the Army in 2008, Banville has served at Fort Knox, Kentucky, Fort Lewis, Washington and Fort Jackson, South Carolina. In May 2012, he departed Goodwin for active duty and was stationed at Fort Hood, Texas before deploying to Southwest Asia. Six years later, now First Lieutenant Banville explained that Army life is not exactly as portrayed in the media and movies. “It’s harder to be a leader than it is a follower, but it’s worth it,” he stated. Banville is working full-time at Goodwin and is still involved in the CT Army National Guard. He participates in monthly training events and is heavily involved in disaster relief when necessary. The CT Army National Guard works with the Federal Emergency Management Agency (FEMA) to support disaster relief and provide a network of transportation assets. “We provide the logistical infrastructure to distribute commodities such as ready-to-eat meals, salt, and water,” he explained. Although juggling a full-time job and serving in the National Guard can prove challenging at times, they provide Banville with a sense of security and fulfillment knowing that he is serving our country and Goodwin’s students.